The best part of of our job is getting feedback from our clients when they return home from their safari. Planning a customized itinerary is not always easy, but we know Africa rarely disappoints. The welcome home call is a chance for us to share the excitement of a first, second or even third safari experience. A recent follow up call with honeymooners Melissa and Eric was no exception. It started with …”we had the most amazing trip and cannot express how wonderful everything and everyone was“.. and ended with: “this was truly a trip of a lifetime“. It’s impossible not to feel happy about coming in to work every day when that’s the end result! So where did Melissa and Eric spend their recent Honeymoon? 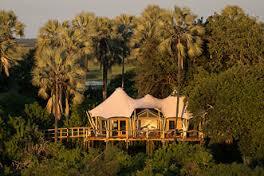 Well, there’s no better value for money than Botswana in the “Green Season“. 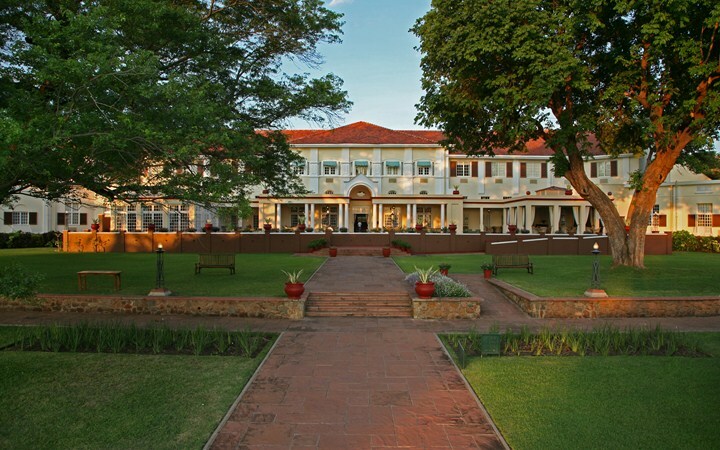 We started them off with a two-night stay at the Victoria Falls Hotel. 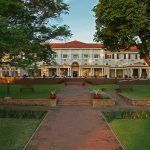 It’s perfectly located close to the Falls and the views are better in February from the Zimbabwe side. It’s also a lovely place for honeymooners to relax, the grounds are gorgeous and it has a fascinating history. It’s a perfect introduction to Africa for those who have never been and are not quite sure what to expect. We arranged a dinner at The Boma with our compliments which is always a fun evening and will get anyone into the spirit of being on vacation. 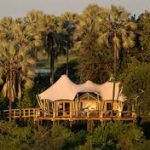 For their Botswana safari portion we took advantage of the excellent summer sale Wilderness had on offer and chose two of our favorite Classic Camps: Little Vumbura and Kwetsani. In their own words …”both camps were gorgeous and the meals were excellent. When we first got into the vehicle from the airport headed to our first camp (Little Vumbura) we immediately saw two lions just feet away from airstrip lying under a bush. This was our first encounter. Nas was our guide in Little Vumbura and we can’t thank him enough for all of his work. Dan at Kwetsani was great. He took Eric and I out to photograph the stars away from the lights and gave Eric some much appreciated photography tips“. ← Melissa W. and Eric F.